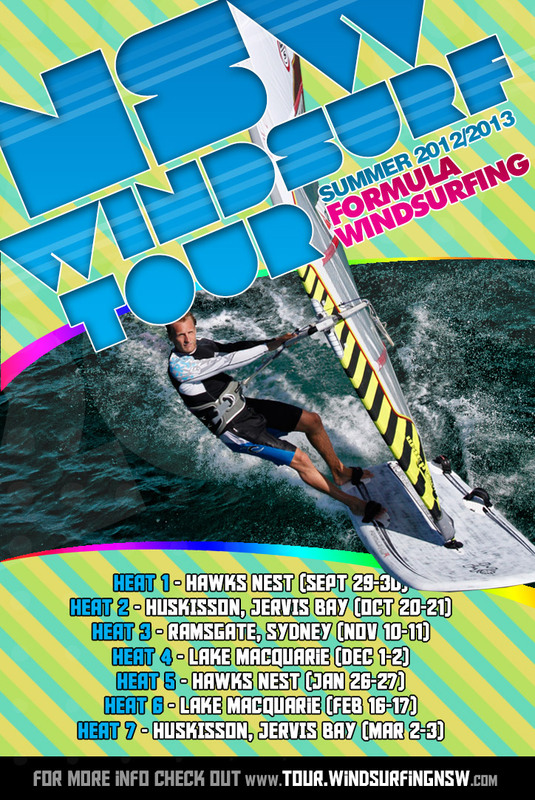 Heat 2 of the NSW Formula Windsurfing Tour was conducted on Huskisson Beach Jervis Bay on October 20-21. Formula Windsurfing is the box rule of windsurfing. It is a development class that encourages different designs and ideas; however the majority of the products available are starting to look very similar. Boards can be up to 1005mm wide, carbon fins are 700mm’s deep and sails can be as large as 12.5M/2. These boards have a massive wind range that enables racing in very light winds from 7 knots up to 35 knots and are capable of reaching speeds of over 30 knots. Jervis Bay provided a spectacular location for this fast and convenient format of windsurfing. Not to mention a perfect place for a family get away. Races are about 20 minutes in length and courses are usually located about 500M’s off the beach, allowing competitor’s to return to shore between races. Two divisions are started and compete on the same course allowing new comers to the class (Free Formula) to race one lap of the course, while the expert’s complete two laps. 28 competitors lined up in five races over two days of racing. Saturdays racing was held in southerly winds of up to 20 knots and four races were conducted in quick succession. Jesper Vesterstrom (DEN111) showed the fleet how to start and displayed outstanding speed to win all four races. Steve Floyd showed some early form, however it was Steve Walsh who ended the day second overall. Meanwhile the Free Formula class saw three heat winners and a dead heat at the end of day one between Andrew Vacopoulos and James Farley. Sunday’s racing saw a Southwest breeze of 10 – 15 knots. Racing started after a short delay and gave the fleet some very tactical racing. Large holes started to appear on the course up the first work and the right paid heavily. Jesper Vesterstrom once again picked the pressure and won the race by a huge margin. Jesper won the weekends racing on 3 points, second was Steve Walsh on 9 points and Remi Dunoyer came in third after five races on 15 points. The next event will be held at Ramsgate Beach, Botany Bay on the weekend of the 10th and 11th of November. The Free Formula division allows any windsurfers that can complete a windward leeward course to compete. Or you could even organise to borrow the club gear and give it a try. 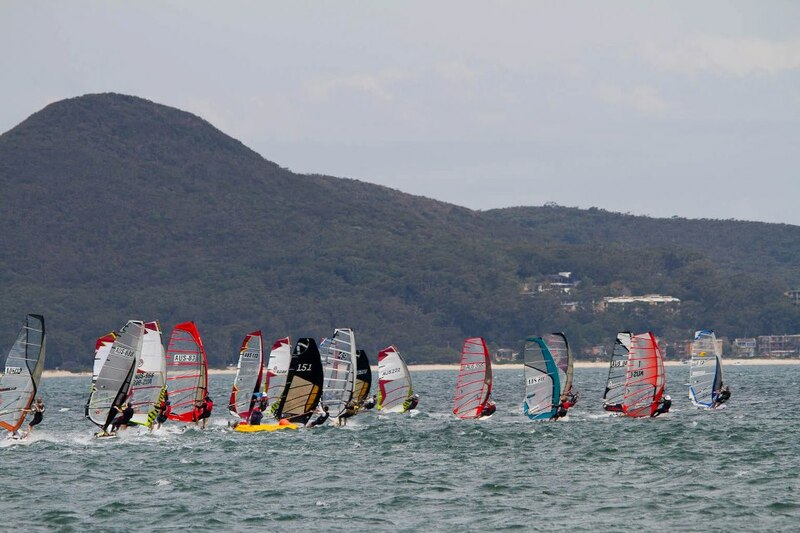 The NSW Formula Windsurfing tour is made up of seven events, mostly weekend regattas held in family friendly and spectacular locations. The National titles will be held at Jimmy Beach in Hawkes Nest at the end of January. This event attracts some of the world’s best windsurfers due to the brilliant venue and excellent racing.